There are a lot of safe genealogical stories out there. This fellow moved over here: he was a shoemaker. That fellow moved over there: he was a tanner. This woman was married twice: both of her husbands were unremarkable, and she named her son John. They had their lives, they lived their stories, and no doubt they had their own wildness about them – it’s just sometimes lost in the only records we have of them. Then there are the truly wild: the legends who were passed from generation to generation. The ones who either succeeded so amazingly or failed so spectacularly that enough people got together and decided they deserved commemorative statues or a place in history books. Some spawned legends, like the many men behind the name “Robin Hood” (see my Pixie-in-law’s post about this) – some men were legends. I have the distinguished pleasure of calling my great-grandfather (x30/x39 – related through both my mother and father, incidentally) one such man: Hrolf Ragnvaldsson, The Dane, The Duke of Normandy. He was also known as ‘Rollo’. He was the first ruler of Normandy in France. Essentially, France grew tired of being raided by the Norsemen, and gave them the lands between the mouth of the Sein and what is now the city of Rouen in exchange for the cessation of all piratical activity and protection against further raids by their countrymen. Linguists have argued over the name ‘Rollo’ and from which language it was bastardized. No conclusions have been successfully put on top of the pile, but it didn’t matter much to the fellow himself, for he was baptized into the Christian faith and took the name ‘Robert’. No one knows exactly where he was born (he’s called ‘the Dane’, but they don’t really know if he was from Denmark or not), but they know he led the Vikings who besieged Paris in 885-886. After which, curfuffle occurred, he lost, and then he was given a bunch of lands because people were still scared of him and his men. He had several legitimate children, perhaps a few not-so-legitimate ones, he died sometime between 928 and 933 (the year in which his son, William, was granted much of his land). Now to the legendary stuff: he was supposedly so big, no horse could carry him. Because of this, he was nicknamed “the Walker”. He is the great-great-great-grandfather of William the Conqueror. Denmark and Norway both want to claim him as a native, and are still arguing about it. He went from a raiding Viking savage to a noble Christian defender of France. He is still celebrated as such today. According to legend, when required to kiss the foot of King Charles, as a condition of the treaty, he refused to perform so great a humiliation, and when Charles extended his foot to Rollo, Rollo ordered one of his warriors to do so in his place. His warrior then lifted Charles’ foot up to his mouth causing the king to fall to the ground. Rollo continued to rule his men very like a Viking chieftain, though he stayed true to his word and defended the banks of the Sein against Norse invasion. This was where France started to get some proper military chops of its own. Now, it could defend itself. It wasn’t many years later that it started looking to expand and rule the British Isles as well. In fact, The Norman Invasion of 1066 was preceded by an invasion of Vikings – the last great Viking raid – led by Harald Hadrada. Hadrada was killed and the defensive forces relaxed just enough before William the Conqueror swept through with his Norman army and took England altogether. That military might was built on one man standing up and saying “I’ll protect. 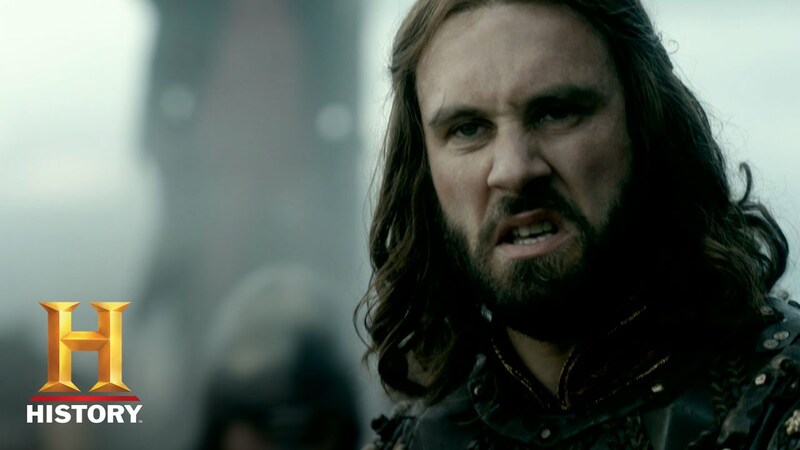 I’ll serve.” That was Rollo. Slowly, but surely, Rollo got settled into his lands and his men began to marry local women. Soon the line between Viking and Norman blurred and it just became Norman. He became France; he became an icon. They have his statue up in Falaise, pictured first in the post. The Normans were known as thugs, probably due to this Viking ancestry. Tho, when settled, they did good works for the invaded countries, not just France, as you point out. I think that blood is reflected in some characters of certain nations. Do you get fired up sometimes!